a (small? how small?) turntable would be really cool. The location of the station building is pretty much set on the city side of the tracks. I converted the former freight area to become the lok station, including a 3 stall round house, and turntable. The round house, as a side-effect, conveniently hides the tunnel entrance of the ramp to the middle level, so I'm hoping that the effect will be "train enters the stage" instead of "train exits yet another tunnel". The space for the service area is tight but workable, given it's a small terminus with only a few road locos to service, as well as 1 or 2 locomotives stationed here. On the other side of the main track is an open air loading ramp, or maybe I put some oil tanks in that corner on the inside of the right turn towards the bridge. A simplified approach for the yard tracks. Basically, I left enough track to shuffle cars for switching and local deliveries. I also re-aligned the tracks in the lok station a bit. I'm not happy with how the switches to the lok station clog up track 1 in front of the station building. I want servicing to be located between the tracks and the turn table. The setup is a bit loose here, since I don't have a turntable (yet), and most roundhouses require a certain distance between turntable and doors, which is larger than what I accounted for here. 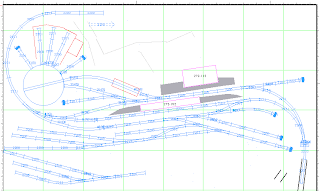 I might have to circle the round house to the right and potentially move the turntable more to the left further into the curve, which would affect the arrangement of the servicing and access tracks. Clearly more accurate planning is needed for this area. A sneaky approach to get more usable length for the yard tracks by using slim switches with a small angle, and allowing the tracks to encroach on middle level territory. The lead track is to short to hold a full cut of cars from the longest yard track, plus locomotive. Here I attempted to address the problem of "how do I get a complete train from the yard onto the main line with no switching maneuvers". As a side effect the industry track on the right gained some space. Unfortunately this also meant more encroaching on middle level territory. 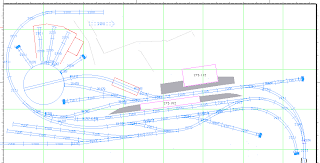 Same idea, with longer yard tracks and simplified trackage, no dedicated yard lead. A variation on the theme that leaves much more space around the industry track, but again requires somewhat odd movements for yard operations. Going back to basics. Instead of trying to squeeze a lot of yard operations into an impossible space, I just go with two storage tracks, making them as long as I possibly can. The alignment of the mainline track slightly changed by removing the curved switch, which leaves space to arrange the two storage tracks more neatly. What I like about this setup is that it allows me to do some switching operations, without eating into space I had originally allocated for scenery, industry, and roads. 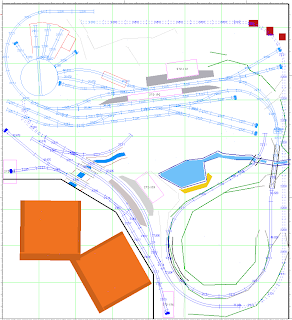 This plan is also updated with the actual track layout I'm using on the middle level around Talheim station and on to the tunnel. wie gut, daß ich davon so überhaupt nichts verstehe! Aber einer gewissen Begeisterung kann ich mich nun auch nicht verschließen. und ... überhaupt ... und davon sowieso ... und da kann man reden, wie man will ... nicht los!